Option panel described before but some items of that are more important, so we describe them in more details. 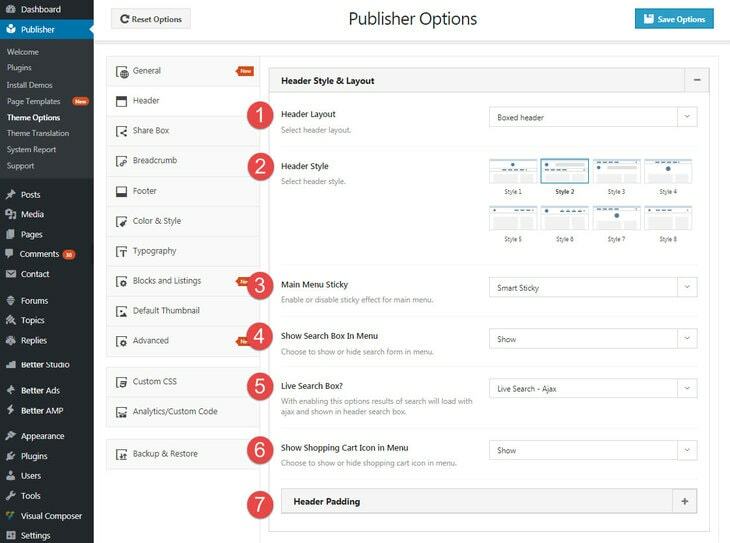 Header is one of those important items, you can find it in Publisher → Theme Options → Header. You can see main categories of header options in below image. In this and next sections we will describe different tabs of Header option panel. Now we start with header styles. Click on Header Style & Layout tab. Boxed header: Maximum width of header is equal to maximum site size. Full width header (boxed content): Content of header is boxed (like Boxed header) but if you have chosen a background-color or background-image for header, maximum width of background stretches to full width of viewport. Full width header (Stretched content): Maximum width of both the content and background are stretched to full width of viewport. 2- Header Style: Select a style for your header. Currently 8 styles are available for header and there is a thumbnail for each of them. The general rule for adding Ads in different header styles: When logo and main menu are side by side, there is no place for adding Ads (styles 5, 6 and 8). When the logo is at one side, one Ad could be added to the other side (styles 2 and 3). Finally when the logo is at the middle of header, two Ads could be added to both sides of the logo (styles 1, 4 and 7). 3- Main Menu Sticky: Enable or disable sticky effect for main menu. Also there is a Smart Sticky; sticky header hides when you scroll down and shows up when scroll up. 4- Show Search Box in Menu: Choose to show or hide search form in menu. 5- Live Search Box: With enabling this option, results of search load with Ajax and shown in header search box (results shown live as you are typing before even you press Search button or Enter button). 6- Show Shopping Cart Icon in Menu: Choose to show or hide shopping cart icon in menu. 7- Header Padding: Change bottom & top padding of header. These options do not work in Header styles 5, 6 & 8.